I was first introduced to white bean soup at Dean & Deluca in Soho, during a fun weekend trip to NYC with my mom. As with most products in that pristine, marble-clad food emporium, we were instantly smitten. No other white bean soup has lived up since, as most are either too bland or too bitter (from leafy green overload). I’ve been wanting to try my own hand at this Tuscan classic, and the recent surge of snowstorms here in Boston proved to be just the perfect atmosphere to experiment with soup making. Canned beans make this an easy weeknight meal to throw together, which is not something you’ll often hear from me. I’m a weekend chef, but a weeknight microwaver. Leftovers are my favorite food group. Reminiscent of potato soup, this hearty dish is the perfect meal to satisfy during these blustery, cold winter days. At the bottom of this post I also included a simple recipe for whole wheat croutons, as crusty bread is the ideal accompaniment (taste-wise and nutrition-wise) to bean soups. Heat olive oil in a large pot over medium-high heat. Add onions and leeks and stir until onions are translucent, about 6-10 minutes. Add white beans and broth to the pot, and bring to a simmer. Stir the parmesan cheese into the soup. Then taste soup and adjust seasonings (salt & pepper) as necessary. Stir the spinach into the soup until just wilted, about 3-5 minutes. 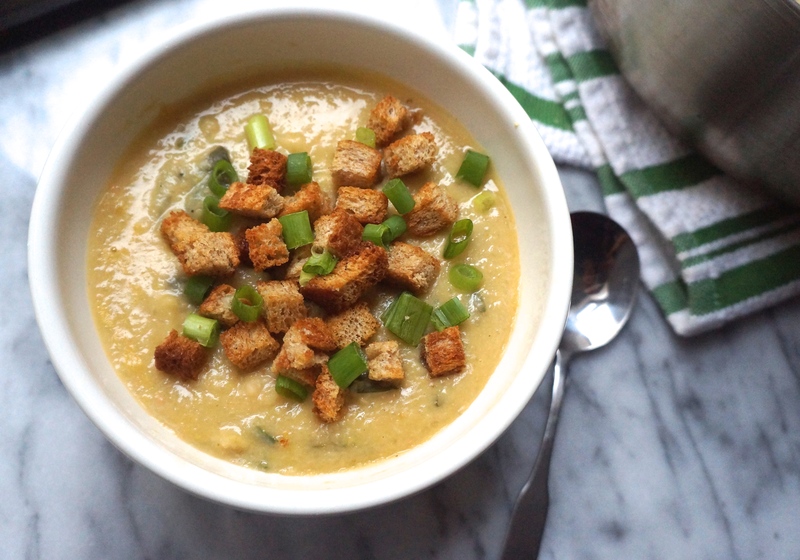 Spoon into individual bowls, and serve with optional toppings, such as sliced green onions or whole wheat croutons. If you don’t have croutons (see recipe below), serve alongside a hearty slice of whole grain toast. How to Make Whole Wheat Croutons: Cut a slice of whole wheat sandwich bread into small (about 1/4 – 1/2 inch) cubes. Toss bread cubes with a light coating of olive oil (I used olive oil spray), then bake on a baking sheet at 350 degrees F for about 7 minutes.